Concertante works for cello and strings are something of a rarity. 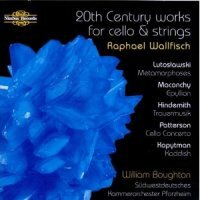 The Cello Concerto was written for Raphael Wallfisch and the Primavera Chamber Orchestra, and it was premiered by these forces at the Rye Festival in September 2002. Patterson connoisseurs will hardly fail to compare the new work with his Violin Concerto of 10 years earlier, not least because they share the same strings-only scoring. But it is the differences between the two works which are most striking at a first hearing. The Cello Concerto is a darker, weightier work than the more freewheeling older sibling. Both make ample use of Patterson’s unique sense of humour, but the present work’s wit is harder-edged, more driven. It is in most senses a larger work than the Violin Concerto, both in length and range of moods. Both works are in several movements linked together in a single, continuous span, but while the Violin Concerto has three movements, the Cello Concerto has just two, welded together by a central Cadenza. Just how far Patterson has moved from the earlier work’s more open lyricism can be gauged from the Cello Concerto’s arctic opening, where time all but stands still as the music very slowly comes to life. But it is not long before pressure gradually increases until the accumulating tension explodes in an enraged climactic outburst. A brief, fraught accompanied cadenza finally restores some calm to the proceedings as the cello begins its long journey, with the orchestra alternately standing motionlessly by or shimmering around it. A solo violin briefly joins the soloist in dialogue before the music reaches its point of arrival on a clear, unencumbered G major triad. With the orchestra’s glistening natural harmonic glissandi swirling around it like a storm of fireflies, the soloist sings its song in its simplest form, with the solo violin once again joining in. The vision does not last long, however, and the music retreats back into the frozen wasteland of the opening. A lengthy Cadenza has the cello slowly clambering out of the darkness, gathering speed and momentum until it finally bursts into the fast second movement where the orchestra races away in no uncertain fashion and never looks back. Throughout the movement the pace remains constant in its drive and momentum, with the soloist and orchestra in ceaseless conversation all the way. The cello breaks off in a second, shorter Cadenza near the end before the music tears off for the finishing line: a D major triad as emphatic as it is unambiguous.